Gordon was the fifth surviving son of Joseph and Fanny Stewart of Rock Cottage, Beeston Mount Bollington. He was baptised 13 Nov 1898 at St John’s. He attended St John’s Parish School. Gordon worked at Ingersley Vale Bleachworks alongside his siblings and his father Joseph. 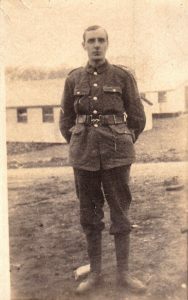 Gordon signed up with the Welsh regiment first and went to France with them with very little training (click on photo to enlarge). 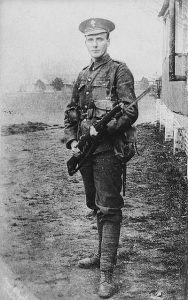 Then he changed to the South Wales Borderers, 2nd Battalion. 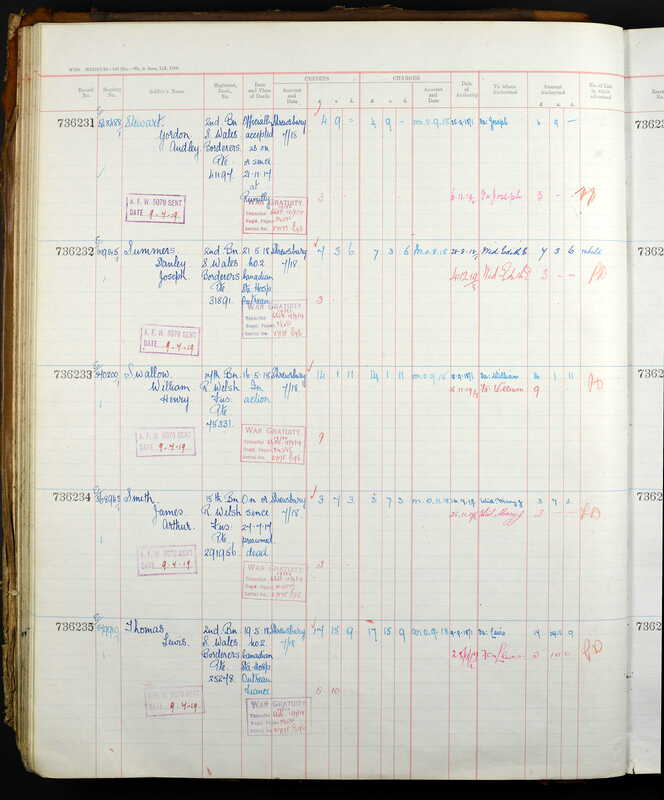 The 2nd SWB were evacuated from Gallipoli to Egypt and then to France, arriving at Marseilles 15 March 1916. They were part of 87 Brigade in 29 Division. Gordon joined the battalion in France, but the date is not known. The battalion were at Rumilly as part of III Corps of 3rd Army in the battle of Cambrai 20 – 21 November 1917. A significant advance was made on the first day of the battle, but the second day was not so successful. 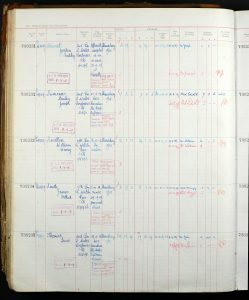 The battalion’s diary for 21 November records 12 other ranks killed, 64 wounded and 75 missing. 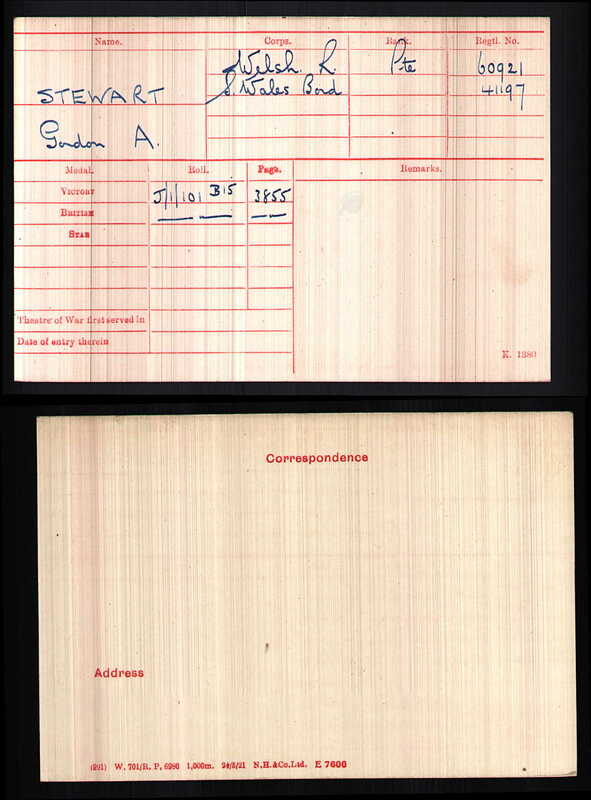 It appears that Gordon was one of those recorded as missing in the diary, but later confirmed as killed. 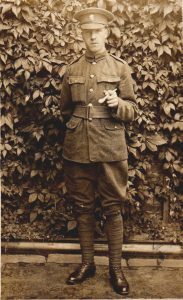 He died in action in Marcoing on 21st November 1917, a year and a week after his brother Hedley. 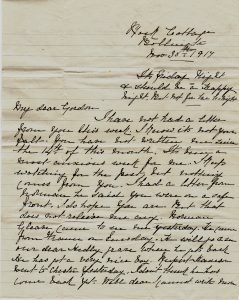 Gordon’s mother Fanny wrote this heartbreaking letter to him asking him why he had not written to her. 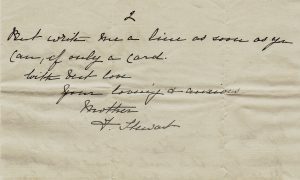 He had been dead nine days when she wrote this. He is named on the memorials at Bollington and St Oswald’s and on the Stewart grave at St John’s [plot 1905]. He is listed on the 1917 Roll of Honour. 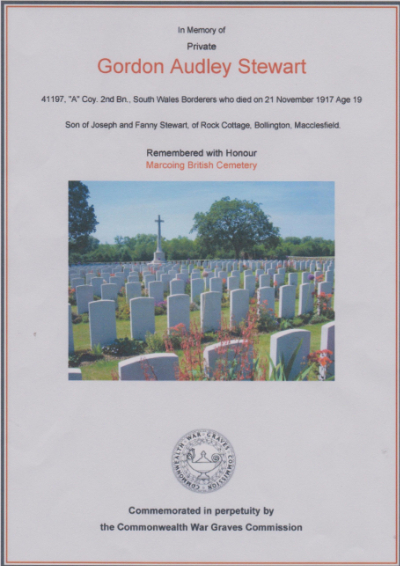 He was named as one of those “who have paid the Supreme Sacrifice during the War” at a Solemn Requiem Service held at St John’s at 10.30 am on 3 November 1918. Gordon had been buried by the German soldiers with nine others in one grave in Rumilly Cemetery. Their bodies were all exhumed by the British almost three years later in July 1920 and were buried in separate graves 500 yds from Marcoing, not far from where the attack started on that fateful day in 1917. It was not possible to identify the bodies. Hedley was the third son of Joseph and Fanny Stewart and was one of 9 surviving children who grew up in Rock Cottage, Beeston Mount, Bollington (click on photos to enlarge). He was baptised at Pott Shrigley 17 Jun 1888. He attended St John’s Parish School. Hedley worked as a `back tenter ` at Ingersley Vale Bleachworks , the same mill as his father and several siblings. Hedley was a sidesman at St. John’s church and secretary of the St. John’s Parish Sunday School. He was a member of the Church Council, and secretary of the Free-will Offering Scheme. 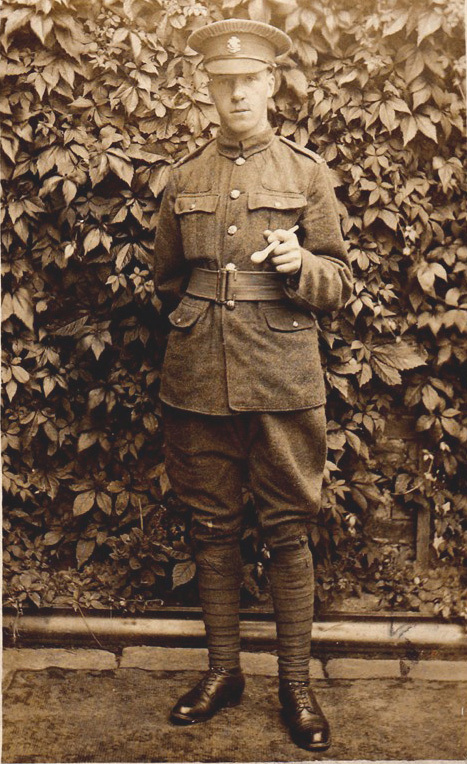 Hedley was 27 when he joined up to fight for his country when WW1 was declared. Rank Private. He trained in England on the Epsom Downs for a year before being sent to France with his regiment on the 14 November 1915. 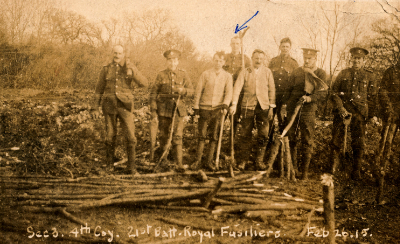 This is a photo of him digging the trenches in England during training 26th February 1915 (marked by an arrow). It is not known when Hedley changed battalions. 21st Battalion was formed at Epsom on 11 September 1914 by the Public Schools and University Men’s Force. It came under command of 98 Brigade, 33 Division 26 June 1915 and landed in France in November 1915. It was transferred to GHQ 27 February 1916 and disbanded 24 April 1916 with many of the men being commissioned as officers. 23rd Battalion was formed at the Hotel Cecil in the Strand, London, on 25 September 1914 and came under command of 99 Brigade, 33 Division in June 1915. It landed at Boulogne in November 1915 and transferred with the Brigade to 2 Division 25 November 1915. 23rd Bn was part of V Corps of 5th Army at the The Battle of the Ancre, 13 – 18 November 1916. The seven-day bombardment before the battle cut the wire on most of the attack front and destroyed many German defensive positions, except the dugouts built deep below the villages near the front-line. The rain stopped on the night of 11/12 November and a full moon illuminated the landscape. Towards dawn on 13 November, a mist developed which reduced visibility to nil. The mist helped the British advance by reducing visibility but caused many units to lose the barrage as they struggled through mud. Losses in 2 Division from 13–16 November were about 3,000. He died exactly a year to the day later on 14 November 1916, aged 27, and was buried at Serre Road Cemetery No. 2, south of Arras, France. 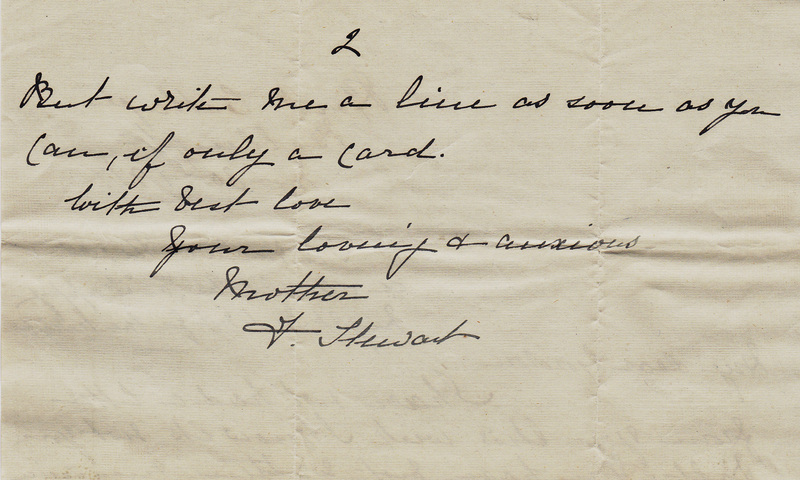 It is with great regret that I have to inform you of your son Private H Stewart who was killed on 14th inst. His death has been a great blow to me and to the whole battalion and I cannot speak too highly of him. 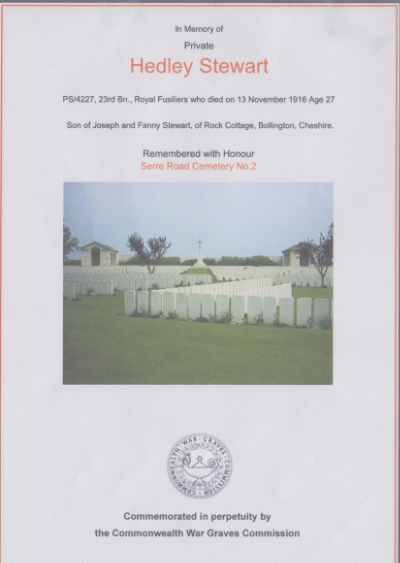 He was killed while gallantly carrying out his duty during our advance in the recent operations north of the Ancre. His courageous work will never be forgotten, and as his officer I can truly say that as one of my best men he is very hard to replace. 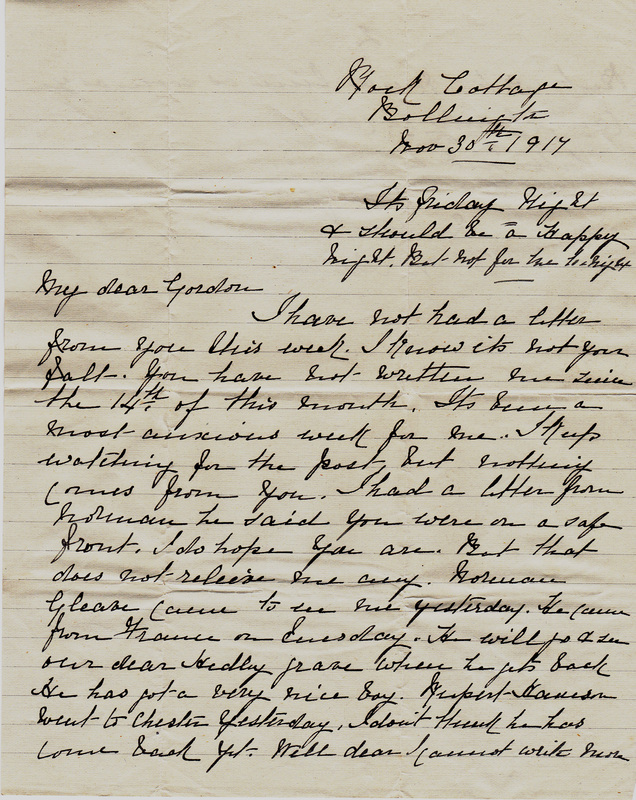 Offering you my deepest sympathy, Yours faithfully, J A Charlier, 2nd Lt Lewis Gun Officer. He is named on the memorials at Bollington and St Oswald’s and on the Stewart grave at St John’s [plot 1905]. He is listed among the “fallen at the post of duty” on the 1917 Roll of Honour. Hedley’s death reported in the local paper. I am indebted to Linda Bester (née Stewart) and Dave Williams for this fascinating account of the lives of Gordon and Hedley Stewart of Bollington. Mark and Lydia Stevens who live in Rock Cottage now went to France in 2018 to find the graves of Gordon and Hedley. 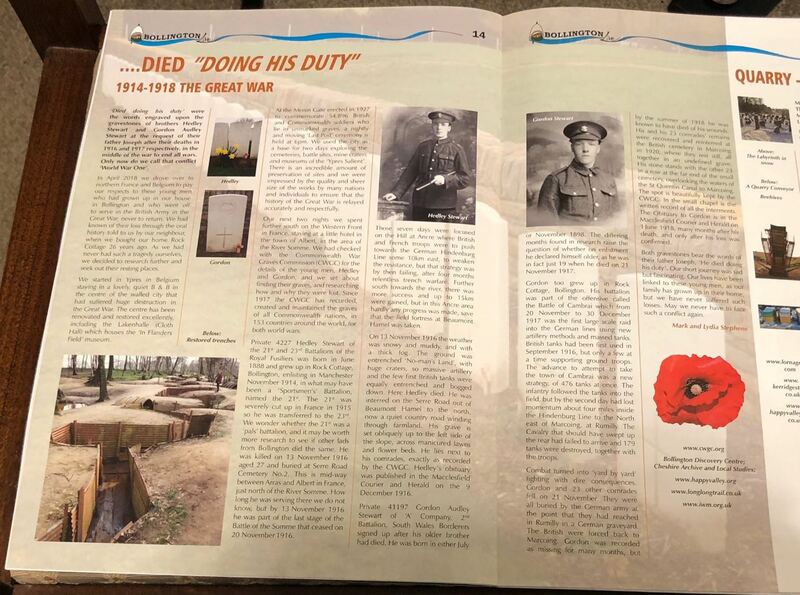 Above is their story from the local Bollington magazine.